Maple Roasted Pumpkin Seeds are a simple sweet snack that can be added in the place of candied nuts in holiday dishes and desserts. During the last couple of weeks, I have been flipping through endless cookie recipes in preparation for a flurry of holiday baking that will be here before I know it. 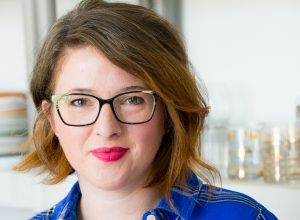 I have collected recipes from my mom, grandma and great grandma as well as my mother-in-law and sisters-in-law that will all be on my to-bake list. This year is going to be all about the classics and baking the cookies of my childhood. Many of these recipes will be relatively effortless to recreate, while others will take a little more thought. You see, in our family there are a ton of cookie recipes that contain nuts. And if you are a regular here, you know that with the Baby’s peanut allergy, cooking and baking with nuts is not something that I can do. There are absolutely no peanuts in our house, and I keep tree nuts to a minimum. Wanting to have some sort of replacement for for nuts in some desserts and cookies, I’ve been using sunflower seeds and pumpkin seeds. 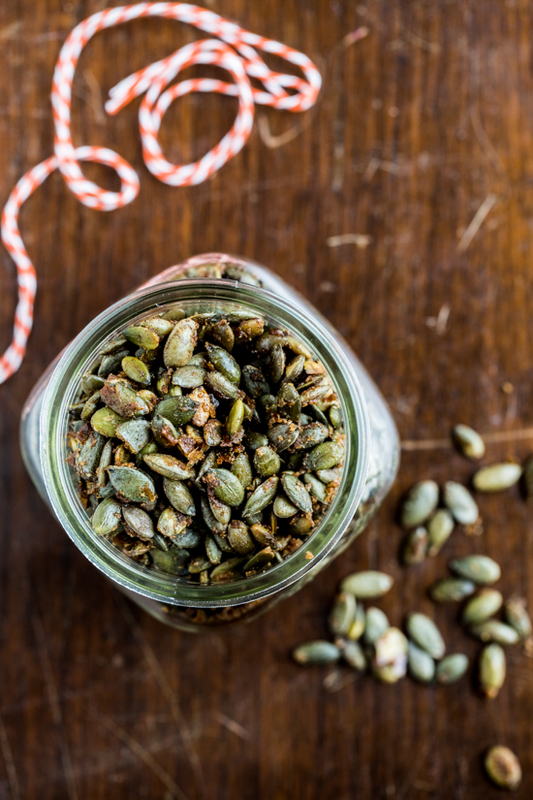 The pumpkin seeds added a perfect bit of crunch to my vegan Warm Kale Salad and Nut-Free Granola, but this time, I wanted to create a sweet, candied pumpkin seed to replace candied nuts in several holiday dishes. Because in all honesty, whenever there is a salad or dessert that’s topped with praline pecans, I develop a kind of laser focus and I will seek out those little sweet bites before eating anything else. These Maple Roasted Pumpkin Seeds are sweet and crunchy with touches of maple syrup and brown sugar. The maple syrup and brown sugar caramelize a bit in the oven, while the seeds crisp up into a satisfying crunchy treat. 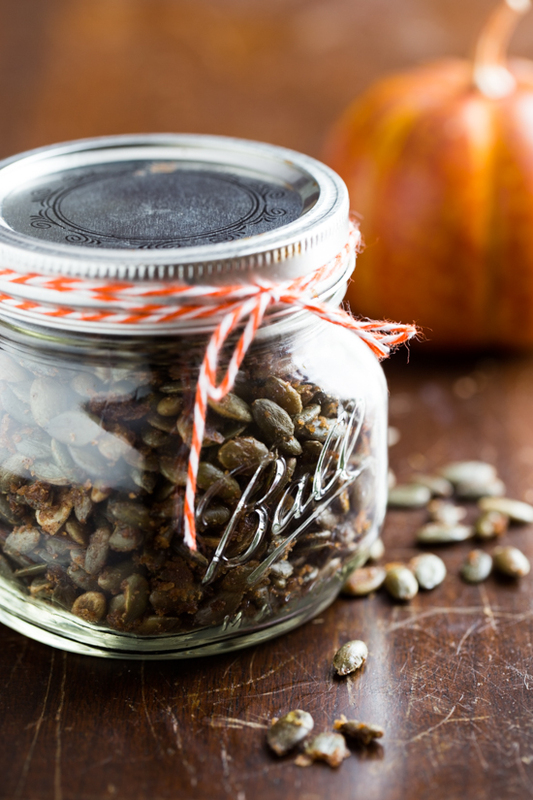 Maple Roasted Pumpkin Seeds are delightful sprinkled on holiday trifles, squash soup and festive green salads. They provide the perfect seasonal touch for any dish, and you can bet that I’ll be working them into some kind of cookie in the next month or so. Alternately, you can just cram fistfuls of them into your mouth when no one is looking. If you’re into that sort of thing. Preheat oven to 300 degrees. Spray rimmed baking sheet with non-stick cooking spray. Set aside. 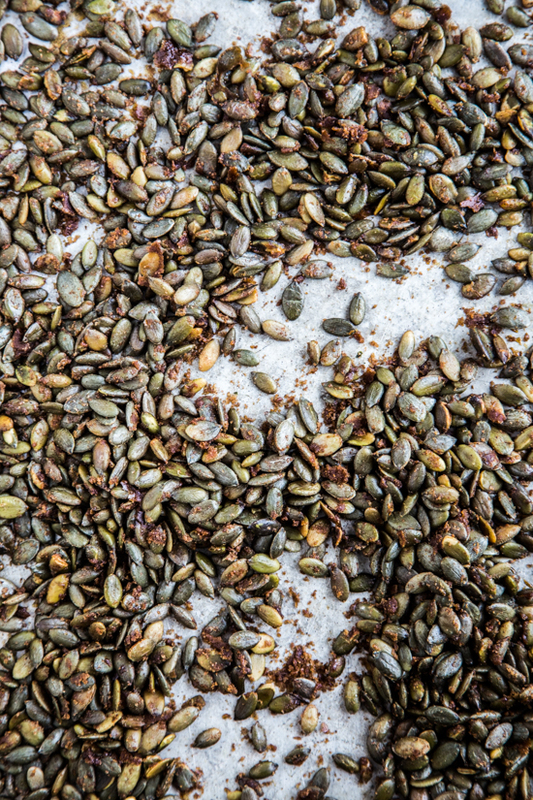 In a medium bowl, toss pumpkin seeds with olive oil and maple syrup. In a small dish, mix together brown sugar and pumpkin pie spice; sprinkle mixture over seeds and toss to coat. Spread seeds onto prepared baking sheet. Bake for 20 minutes, stirring half way through bake time. Allow seeds to cool completely. Store seeds in an airtight container at room temperature. Love the maple with the pumpkin seeds. Perfect snack. Thanks so much for this! I am from NZ and I made some of these tonight thinking they would be a super treat for my peanut allergic almost 6 year old! We don’t have pumpkin spice but they are delish without. I had to stop myself from eating them as they would be none left for her in the morning to try! p.s. I searched high and low in NZ and managed to find some pumpkin seeds that were peanut free, but not nut free (not ideal but had to do). Do you think sunflower seeks would work well like this?? Yes! While I’ve never made these with sunflower seeds before, I can’t imagine why it wouldn’t work. I’m glad you were able to find some nut free seeds, it’s a really hard thing to do. Good luck and thanks so much for stopping by! 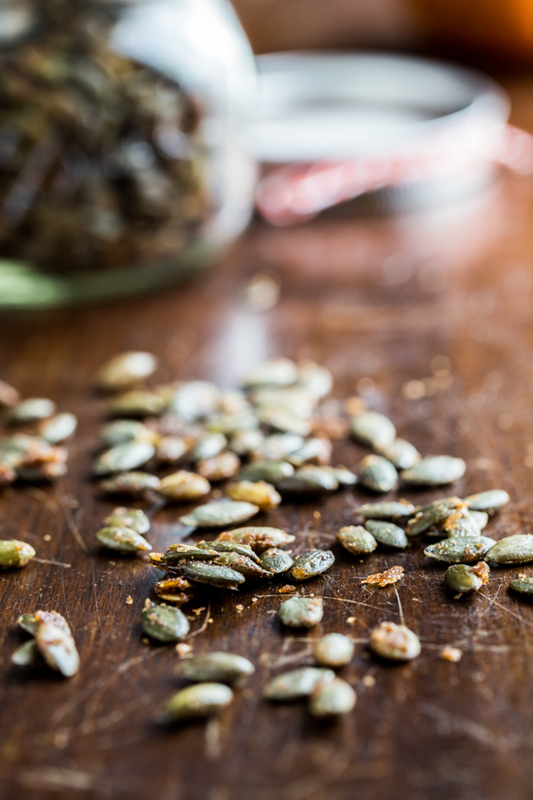 Pingback: 18 Ways To Make Pumpkin Seeds Delicious - Do You Still Hate Me?